Written by admin in Help and Advice on Jan 15, 2019. The Relative Humidity(RH) which is a measurement of how much moisture is present in the air. Thecorrect RH of a room’s atmosphere, for wood flooring to be installed, falls between45-65% with an ambient temperature between 18 to 24°C. If necessary employ adehumidifier to maintain suitable conditions. NOTE: Wood Floors aregenerally not suitable for bathrooms where there is regular running water or anaccumulation of water vapour. All wet trades suchas concreting, screening and plastering should be completed and the buildingshould be thoroughly dried out. Wood is a hygroscopic material and will absorbany excessive moisture which can cause problems. NOTE: Plaster may take several months to dry satisfactorilyand concrete screeds depending on thickness may take considerably longer. As arule of thumb drying time for cement and water based screed is one day permillimetre for the first 50 mm and unto 2.5 days for each subsequentmillimetre. IMPORTANT: As with all screeds please consult themanufacturer for precise drying times and accelerated drying with heat shouldbe avoided as this may weaken the screed. Decorating should be completed wherepossible, and paint should be completely dry as this can also add moisture tothe room. Any sanding should be done before the floor is laid as fine dust canpermeate into the wood and can be impossible to remove without damaging thesurface. Room Temperature will have an effect on relative humidityand should be stable before your flooring is delivered to site. Heatingincluding underfloor heating should be fully tested and working for at leasttwo weeks before the flooring is laid. Room temperature should be between 18 to24°C. Flooring must not be exposed to excess heat such as from hotwater pipes below floors. The subfloor is keyto a successful installation and will help ensure your floor performs to itsvery best. The subfloor is likely to be either wooden or a cement based screed.Sweep and vacuum to remove any dust and debris. Any decorators dust should beremoved as this can be very abrasive and hard if not impossible to remove fromthe surface of a floor without drastic sanding and resealing. Existing floorcoverings should be removed, this includes carpets, underlays, parquet blocks,ceramic tiles and any adhesive residues should be removed. It is important todo this so the subfloor can be verified as stable. The subfloor must be free from excessive undulation and flatto within 3 millimetres over 2 lineal metres across the whole floor area. Thismeans a maximum 3 mm gap under a 2 m long straight edge, at any point acrossthe subfloor. Failure to keep to these tolerances may result in squeaking ordeflection which may produce undue stresses on the joints, cause gaps betweenflooring elements and with fully bonded floors may result in inadequate contactbetween flooring and adhesive. Wood Flooring should only be laid on a subfloor which isstructurally sound and free from movement. To prevent movement wooden subfloorsmust be of load bearing strength and free from deflection under loading.Suspended wooden subfloors should typically consist of a suitable board of 22mm thickness on joist or battens at 600 mm centres or 18 mm thickness on 400 mmcentres. For other types of suspended floor please check with the manufacturer. Wooden sub-floors should contain no more than11% moisture content and must not be more than 2% higher in moisture than theWood Flooring. When installing wood flooring at ground floor level (or below)above a ventilated cavity (e.g. floorboards suspended on joist), it isessential that a purpose made moisture barrier building paper is installed overthe sub-floor before flooring can be installed. The moisture barrier must takenup the walls by 30 mm at the perimeter, and all joints overlapped by a minimum200 mm and taped with a water proof jointing tape. Concrete slabs and sand-cement screeds must be sound, dry,free of laitance and other substances which may impair adhesion (e.g. Bitumenadhesive residues etc). Mineral based sub-floors must be less than 75%equilibrium relative humidity and less than 65% relative humidity for glue downof engineered flooring. Anhydrite screeds must be less than 0.3% actualmoisture content. Sub-floors at ground level or below must contain an effectivedamp proof membrane to protect flooring from ground water in compliance withBritish Standards. If there is any doubt that the sub-floor meets the requiredstandard for moisture or the sub-floor does not have an effective integral dampproof membrane, a suitable surface applied damp proof membrane must be installed. Acclimatising is used to balance the wood flooring with theenvironment it is going to be used in. Once you are satisfied that the correctpreparations have been made, your floor can be delivered and as part of yourguarantee conditions, it is essential to acclimatise your flooring prior toinstallation. Your floor should be kept in it’s sealed, unopened boxes andshould only be laid flat, ideally in the room in which it is to be installed oras close to typical living conditions as possible. Do not store packsoutside or anywhere with different ambient conditions to the rooms where it isto be installed. If your flooring is not correctly acclimatised planks can warpand bow and become difficult or impossible to install. Engineered wood floorsshould acclimatise for at least 3 days and solid floors should have at least 7days. Note: A certain amount of bowing in engineered floors iscommon and if the bowing is no more than 25 mm then these boards can beinstalled and will lay flat with a random staggered laying pattern. Engineered floors can be installed as floating floors overWood’s Good underlay or fully bonded using Wood’s Good Flexible MS adhesives.18 -20 mm floors may be fixed to wooden subfloors using secret nails. Where practical install floor parallel to the longest wallsso that the direction of greatest potential expansion (i.e. across the widthand grain) does not coincide with the direction of greatest dimension of thefloor, especially in large areas. Before you install the first row measure thewidth of the room and divide this measurement by the width of the board, thiswill give you the number of rows of boards. This is useful as the last rowshould not be less then 60mm. If it is then the first down should be rip cutalong the length to make the last row wider. To achieve the desired mix of colours, shades and othercharacteristics in the final floor, and to avoid clusters of characteristicssuch as knots, the contents of multiple packs should be mixed during installation.Avoid grouping similar colours and grain pattern by mixing the planks beforeinstallation areas of dark and light planks can look patchy and out of place. NOTE: The installer is the last line of quality control. DO NOT INSTALL BOARDSWITH OBVIOUS DEFECTS. 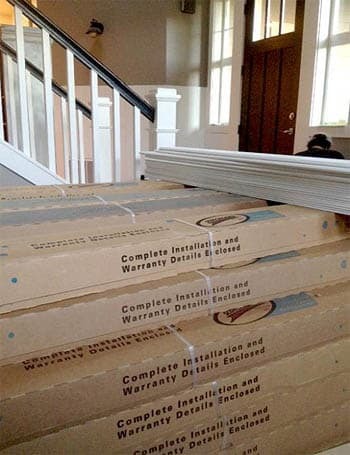 Check each board before it is installed for possible damageor defects, this is important as installed defects are the responsibility ofthe installer as the installer is the last line of quality control. Samples must be taken as a guide only and colour/shade andother characteristics will vary. Before installation commences rack out a smallsection of boards for the client approval. The installer is the last line ofquality control. The flooring product may include up to 3-5% of boards which donot meet the normal tolerances or grade and considered normal. For installation of flooring planks which run in the samedirection, header-joints must be staggered by a minimum of two board widthsapart. It is also important to even patterns across the floor as this can causedimensional weaknesses as the floor expands and contracts. The header joints aretoo close in this pattern and will cause a line of weakness in the floor whichcould open up as the floor expands and contacts. Avoid this type of ‘H’ pattern where header joints line upas it will lead to weak points in the floor where parallel boards may warp andcause an accumulation of excessive movement. Engineered wood flooring may be installed as a floatingfloor, which means that the boards are joined together and loose laid over thesubfloor,, instead of being fully bonded with adhesive or secret nailed. This is achieved firstly by laying a 3mm or thicker purposemade underlay at 90° to the planned direction of the flooring, then laying theflooring and bonding the interlocking boards at the tongue and groove jointswith a D3 grade moisture resistance PVAC adhesive. When bonding tongue & groove parquet PVAC adhesiveshould be applied evenly with a continuous bead, along the top of the groovedjoint. The following panel (tongue) should be firmly pressed in tothe groove to ensure a tight fit, a wooden block can be used to assist and toprevent damage to the tongue. If extra strength is required PVAC adhesiveshould be applied evenly to both top and bottom of the groove. Do not inject adhesive into the base of the groove (e.g. as the groove edge of the boards face upward vertically) as this may prevent the tongue and groove joints from closing. (See Illustration). NOTE: It is strongly recommended that both header and lengthjoints be bonded with PVAC and NEVER spot glue, to avoid weakness and potentialgapping as the floor naturally expands and contracts. It is stronglyrecommended that a purpose made impermeable moisture barrier is used belowfloating wood floors. The moisture membrane may be used in the form of 1000gauge polythene damp proof membrane for concrete which is laid over thesub-floor before the underlay, then flooring is laid. Alternatively an underlaywhich incorporates a moisture resistant barrier may be used. In either case themoisture membrane is taken vertically up the wall and trimmed off above thefinished level of the wood floor surface. All moisture barriers must be tapedat the joins with a purpose made jointing tape. Polythene damp proof membranesare overlapped by 200 mm or greater before joins are taped. Wood flooring is affected by seasonal climactic changes and will expand and contract, so it is important toallow room for this expansion. Expansion spaces of minimum 12mm for floors less than 25m2 or minimum15 mm for larger areas must be left wherever the floors meets obstructions including all walls, door frames,thresholds, structural support, fireplaces etc. These expansion gaps can be covered using the skirting, oredge trim (e.g. Scotia, Quadrant). It is recommended that an expansion break is always employed whererooms join. T- Bar threshold strips can be used for this purpose. Alternatively where wood floors meet otherfloor coverings a suitable Reducer threshold strip may be used. 1. L-shaped halls arebetter suited to fully bonded installation than floating. 2. If installing as afloating floor in L-shaped areas, in commercial use or over under floor heatingensure that the joints are double bonded with adhesive applied to the upper andlower portion of the groove. 3. Where necessary use flooring straps to achieve closedjoints. 4. Flooring must not be exposed to artificial heat sourcessuch as from heated pipes at shallow depth below screeds, or suspended pipesbelow. Engineered wood flooring may be installed direct to concreteor sand-cement screed subfloors, or to suitable wood based sub-floors (e.g.Plywood, OSB) by fully-bonding with a purpose made permanently flexibleadhesive (e.g. 1 component Polyurethane or SMP). Wood’s Good MS and MS Plusfloor adhesive is fully tested with all Maples & Birch Hardwood Flooringproducts and is recommended. The adhesive is applied to the sub-floor onlyusing a V-notched trowel, which creates ridges of adhesive which the flooringis bedded into when laid. Always use the trowel type which is recommended bythe manufacturer of the flooring adhesive for the type of wood flooring beinginstalled and replace worn trowels. 1. When installingflooring uplift occasional boards after placement and examine the residues ofadhesive on the underside of the board to ensure the board is making full contactwith the bed of adhesive. 2. For UFH hot watersystem embedded into concrete full bond is recommended as it improves the TOGrating. 3. Previous floorcoverings and the adhesive residues used to adhere floor coverings tosub-floors must be removed before bonding of wood flooring. 4. Ensure screeds areof adequate cohesion strength of before installation. 5. Avoid accelerateddrying of new screeds as this can lead to poor cohesive strength, especiallyover under floor heating. 6. Always check therecommendations of the applicable adhesive manufacturer, esp. regarding othersub-floors. e.g. asphalt, anhydrite etc. 7. Some chipboardproducts have a moisture resistant treatment which can seriously impairadhesion. A layer of plywood may be laid over and securely fixed to the chipboardbefore installation may commence. 8. 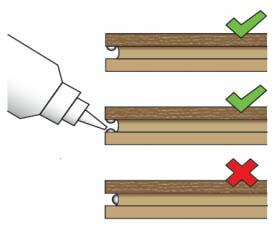 Any residues of MStype adhesives which come into contact with the face of the board must beremoved whilst wet, as cured residues are not removable. 9. Concrete slabs if fully bonding down engineered flooringmust be<65% relative humidity. Testing of subfloors must comply with BS8201Code of practice for wood based products & BS 8204 Screeds, bases and in situ flooring.><65% relative humidity. Testing of subfloors must comply with BS8201Code ofpractice for wood based products & BS 8204 Screeds, bases and in situflooring. Solid wood floors canbe secret nailed or screwed onto joists or battens as a load-bearing floorwhich is known as mechanical fixing, this method can also be used for solidwood flooring onto an existing timber floor, or any sound sub-floor which isthick enough to adequately take a nail or screw (e.g. building gradechipboard). Secret nailing involves the use of a special nail gun asseen in picture (right) which is used to drive a nail through the side of the tongueseen in diagram (right). If the floor is to be nailed or screwed down there has to besomething under the new floor that is capable of taking a nail or screw such asjoists or battens (when using 20mm flooring), or a chipboard subfloor orexisting floorboards. When fitting over existing floorboards, we normallyrecommend running the new floorboards 90 degrees perpendicular to the oldfloor. If this is not possible, perhaps due to the aesthetics of the room, theexisting floor can be overlaid with plywood. Using a quality MS polymer adhesive this method is suitablefor fixing both solid and engineered wood flooring, usually when fitting onto aconcrete subfloor. The concrete base must be level and fully dry and primedwith a continuous liquid damp-proof membrane before install. It is essentialthat the liquid DPM/Primer and adhesive are compatible and advise that both ofsame brand/type. A reputable fitter should be able to provide a damp meterfor this purpose. If you are installing the floor yourself, we would recommendthat you seek professional advice to ascertain the sub-floor moisture level. The sub-floor must be level to a 5mm in a 3m span and shouldbe sound, smooth and clean. It must be free of dust, dirt, wax, loose paint,all curing compounds, chemicals or any other foreign substances that mightinterfere with a good bond. 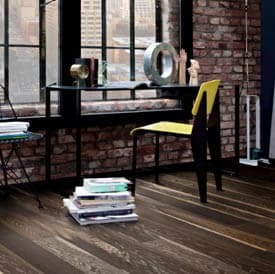 Even fully bonded wood flooring is affected by seasonalclimactic changes and will expand and contract, so it is important to allowroom for this expansion. Expansion spaces of minimum 12mm for floors less than25m2 or minimum 15 mm for larger areas must be left wherever the floors meetsobstructions including all walls, door frames, thresholds, structural support,fireplaces etc. These expansion gaps can be covered using the skirting, or edgetrim (e.g. Scotia, Quadrant). It isrecommended that an expansion break is always employed where rooms join. T- Barthreshold strips can be used for this purpose. Alternatively where wood floorsmeet other floor coverings a suitable Reducer threshold strip may be used. All Maples & Birch of the engineered floors can be usedwith underfloor heating but we recommend reading detailed installation guidesbefore you install with underfloor heating. IMPORTANT NOTE: The flooring installer should ensure thatall services (not only heating services) running beneath the floor have beentested fully by the services installer before laying starts. Underfloor heatingbeneath wood flooring presents special problems because of the wide range oftemperature to which the flooring is subjected. NOTE: Installation should be fully bonded when possible toinsure optimum heat transfer. The following information will help you get the most fromyour heating whilst keeping you wood floor in good condition. Do not allow humidity below 45% RH, or above 65% RH. (Asmall domestic humidification unit can be employed to avoid low humidity duringthe winter heating cycle if necessary. Do not allow the floor temperature to exceed 27°C,(including under rugs). Avoid thick insulating rugs. (Note: as this will lead tohigh floor temperatures).Do not commission the UFH for 48 hours after theinstallation is complete. This gives the adhesive time to fully cure and allowsthe floor to generally settle. Do not turn the system straight up to maximum.Gradually increase the temperature 1oc per day until you reach your optimumoperating temperature. And never exceed 27°C at the surface temperature. 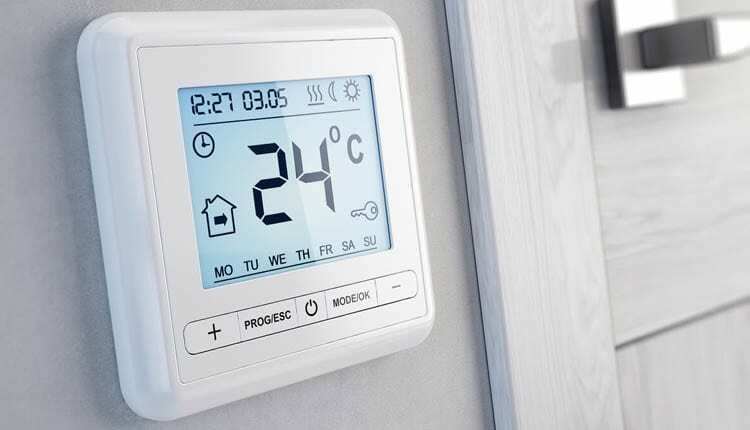 We strongly recommend a dual thermostat system is used tomonitor the surface temperature and the ambient temperature of the room. Do not turn the heating on or off suddenly. Throughout thelife of the flooring avoid any rapid or big temperature changes as fluctuatingthe heat within the product runs the risk of drying out the timber. This canresult in dimensional changes causing the floor to split and crack. Where underfloor heating is involved, particular attentionshould be paid to ensure that the top surface temperature of the wood flooringshould not exceed 27 °C. This information is not intended to be exhaustive, or a howto guide for the novice, but will serve as a guide only to the experiencedinstaller. Further information is available in request.